SYRIAN ARMY HAS ENTERED AL-RAHEEMA VILLAGE IN NORTHERN ALEPPO DESTROYING ALL FORTIFICATIONS, SEIZING A HUG STOCKPILE OF WEAPONS FROM TURKEY AND SAUDI ARABIA. SYRPER PREDICTS THE TOWN WILL BE RAT-FREE BY THURSDAY MIDNIGHT DAMASCUS TIME. Kafr Hamra: A nest of terrorists belonging to Nusra was destroyed with 6 killed and 3 taken prisoner. No names. A’zaaz: Very important, this is the 17 day the SAA and SAAF have been active on this crucial point near Turkey. We know there were direct hits on terrorist encampments, but have no details. Al-Sha’aar Quater: 2 terrorists killed moving from one apartment to another. Citizens alerted police who surrounded the criminals and killed them. Al-Sukkari Quarter: Skirmish with no details. Bustaan Al-Qassr: Savvy tactics evidently used to force a pack of hyenas out of a fixed position. Wael tells me the pack was forced to regroup and fight from a dilapidated apartment. No casualty reports yet. Hanaanu: More fighting. About to fall. Tenacious rodents from Nusra fear death at the hands of SAA and ISIS or, even angry residents of Aleppo. Khaan Al-‘Asal: Confirmed 3 pickups with 23mm cannons destroyed by SAA and NDF. Terrorists cannot last much longer here with their supply lines completely cut. 17 dead terrorists. Dayr Jamaal: Another nest of Ahraar Al-Shaam destroyed. No details. Fighting reported all along these fronts: Al-Mansoora, Daarat ‘Izza, Greater Awram, Al-Ataareb, Tal Hataabaat, Huraytaan, Industrial City (rats starving), Tal Balaat, Al-‘Uwayja, Ba’eedeen, Handaraat, Al-Jandool, Qastal Mushut. Those of you who have been mapping the progress of the SAA can see the pincer closing. Supply lines from the north are being blocked, especially by bombing A’zaaz. The Turks seem incapable of developing a strategy to galvanize their own soldiers who seem, according to Wael, to be indisposed to helping dyed-in-the-wool Jihadists. Don’t forget, most Turks are not fanatical Muslims and distrust bearded sociopaths. I have the highest respect for the Syrian Army protecting the Syrian people. The US Military has worked to sell out the American people along with the US elites and NWO. Here is a story of brave Christians and Kurdish Sunnis banding together to protect themselves in Iraq. Glad to see Aleppo encirclement hapenning, after it the hundreds of cities north of it will be freed in a flash time. It is all connected and that will be the end for rats plan on Syria. Push onwards SAA, my kudos to these brave heros. Thanks Ziad once more for wonderful news, have a nice time on your trip ! I could not find Al-Raheema or anything similar enough on wikimapia, is that village between Handarat and Haritan towns in the center of snapshot you’ve posted? Those names are tricky sometimes for us who can’t read arab. I surely hope it’s the village i mentioned, because, if that’s the case, Aleppo encirclement seems completed. I can’t wait the moment when it actually happens. Try not to die laughing. So apparently this was taken at an ISIS boardinghouse for the criminally perverted. 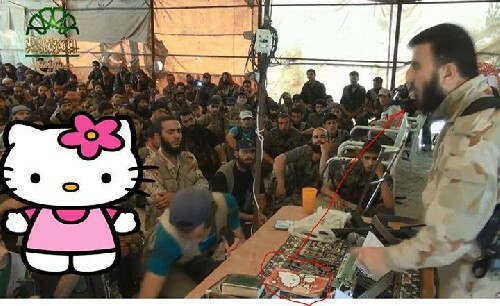 Amongst the apostate satanic death cult indoctrination packages the Emcee had with him, was none other than a Hello Kitty coloring book. Shows you the level on which these nihilistic buttplugs operate. It would have been finished but the guy predictably ate his crayons and passes a rainbow candle every morning. The zionazis at zoutube have deleted the account of ANNA News several times. And ANNA News has several times gotten the deletion turned around. ANNA also have an account at Rutube where they post their videos which is not being constantly persecuted by zionazi scum. “Atlanticist and Gulf television channels announced the fall of Mosul to ISIL militants six hours before they entered the city. This technique, typical of 4th generation warfare, is designed to break the morale of the population and to undermine its resistance. A little of topic here.. but some interesting prediction made long time ago even Before the collapse of Soviet Union , that predicted many of the world events including the Russia fall (soviet union) and will rise again and become saviors of the world and the hope of humanity. many predictions about Russia made since centuries ago..
Nice article outlining why iran and Qatar are talking. I have an Iranian family moving in tomorrow. Poroschenko is talking peace whilst continuing his war plan. It’s getting worse in Ukraine. They wiped out a whole village without any freedom fighters in it. It looks like things are proceeding quite well in Syria, howeverI saw a report that ISIS have taken over quite some area. So I see that terrorists in Ghouta are railing against ISIL screaming for help, and reports that Nursa has been driven out of the oilfields of Syria by ISIS. Combine this with the fantasy pedded by Kerry that “syrians rebels will be an important resource in fighting ISIS.” When ISIS bolted for Iraq myself and others postulated that this effort will end up in “normalizing” the other radical factions which would lead to more positive public opinion regarding ( overtly ) supporting them. I fear we’re on the march to being proven right. TDS though always try and twist things. Genocide on its way: Ukraine may see ‘total hell breaking loose’ – Law Prof.
State Department spokeswoman Mari Harf said at a briefing, “A total of 110,000 Ukrainians who have left for Russia in an attempt to save their lives probably just want to visit their relatives and then travel back”. Armi recapture the industrial city of Sheikh Najjar. But it’s not clear what part of the industrial area aren’t still in SAA hands. Maybe Ziad Saturday can clear us more about this. The second, what happenend to SANA agency in english? It always redirect me to the one in arab, absolutely impossibile to read. The liberation is confirmed also on the official news, al-Rhaimia, al-Muqbela and all the villages, farms and hills that surround the industrial city were also liberated. JEWS GOT ‘PRANKED!’ – Internet hackers briefly took over an Israeli army Twitter account on Friday, posting an alarming message that an Israeli nuclear facility had been hit by rocket fire. Internet hacking group the ‘Syrian Electronic Army’ claimed responsibility, posting a screenshot of the army’s Twitter page with at least two of its fake tweets. HA-HA! Good for them. It’s good to have a practice run before it really does happen. Hopefully soon! I have heard reports that Syrian special forces have just destroyed an ISIS camp outside of Raqqa, does anyone know anything about this. Saudi apes to directly enter Iraq/Syria conflict? Sorry ANON – Just saw your earlier post. You beat me to it. Please forgive my unintentional Plagiarism.